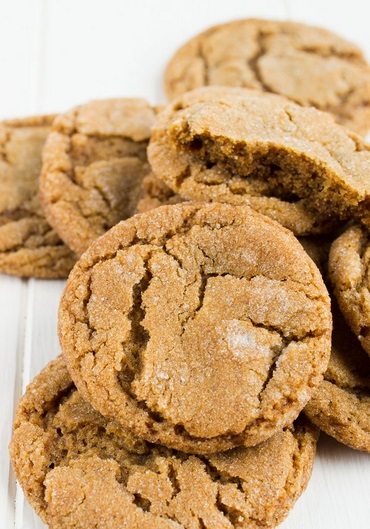 Question: I use a delicious recipe to make ginger molasses cookies. Though the cookies tasted great, my cookies didn't develop any cracks in them like the ones in the picture. I tried baking them for longer, but that just resulted in them becoming more crispy and browned a little more. How should I modify the recipe to get the traditional cracks in the cookie? P.S. : The only modification I made to the recipe was to use unsalted butter instead of margarine. Answers: Chris hinted at it -- to get the cracks, you need to have the top set early, so it's not going to expand while the middle's still trying to rise, and there's still enough leavening left to break through the crust that formed. Making too thin of cookies (you need enough mass in the middle so it finishes cooking after the top's set). And Jennifer mentioned -- old baking soda can be a problem. I'd also consider investing in an oven thermometer to make sure that it's really providing the temperature the dial claims, as those are the two things that are going to be the most difficult to judge if they're a problem or not. You'll also want to make sure the oven is properly pre-heated (so it doesn't lose all its heat when you open the door to put the cookies in), and avoid opening the door again 'til it's time to pull them. If you have to rotate them (as the oven cooks unevenly), do it as quickly as possible so the oven's not open for very long.